from 1918 Until His Death. ceremony for the new marker in 1995. For both Doll and Kenny, who viewed Joe Callicott as a father figure, it was indeed a moment charged with emotion. Watching her face, he tentatively awaited Doll's reaction and smiles slowly grew across their faces. “He was a great, great man,” exclaimed Brown, recalling fondly the man who taught him to love music and to play guitar. In 1960, Kenny Brown was not happy at all about moving with his family to the tiny hamlet of Nesbit on Pleasant Hill Rd. In his pre-teen years, he was introduced to the world of fife and drum bands and country picnics, but he was restless, somewhat torn between being at odds and coming to grips with his own talent as a musician. In 1964, Brown's decision to go talk to the old man who had moved in next door, who was rumored to have a famous past, helped break him out of his funk. 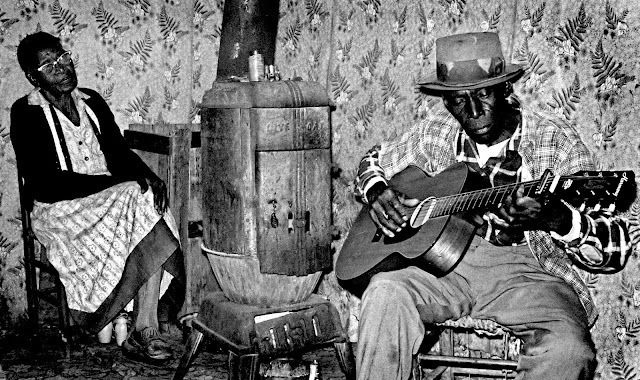 "Inside there was a pot-bellied stove," he recalled, and Joe Callicott sat on the front porch playing guitar every afternoon. The music of Callicott called out to him in much the same way as the Sirens of Homer's Greek Odyssey. 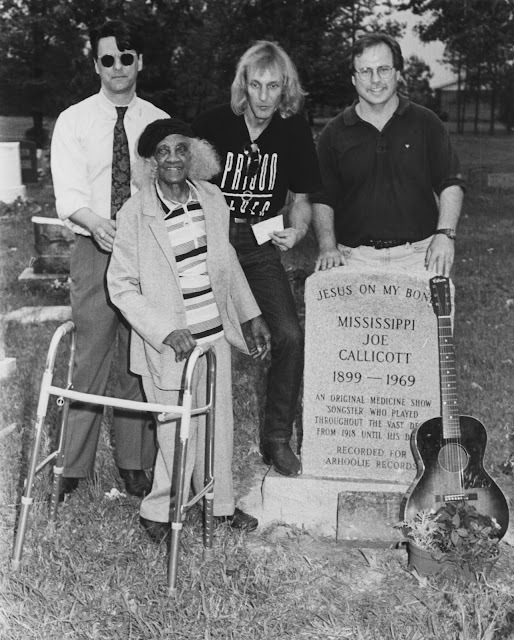 Once he set his mind to learning the guitar, Brown recalled, "he taught me like a father.” A slightly older North Mississippi musician, Bobby Ray Watson, who also visited the Callicott home as a student on a regular basis, served as a cultural bridge for many aspiring guitarists. 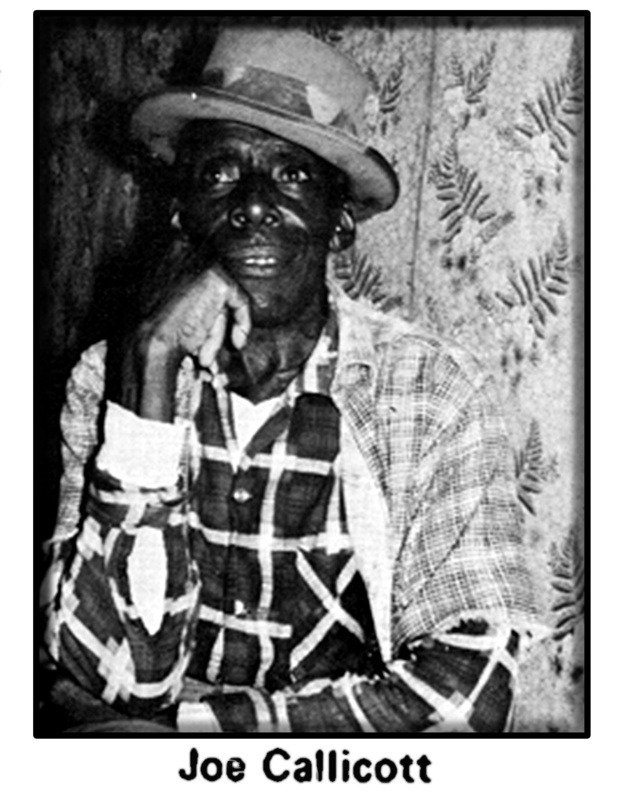 Watson, for example, introduced the young Kenny Brown to the larger musical world of the hill country, specifically a harmonica master named Johnny Woods from Pleasant Hill and another hill country blues guitar legend named Fred McDowell, a most pleasant result of Brown's attendance at the 1969 Memphis Country Blues Festival. Early in life, Callicott had tasted glory as a musician, fell into obscurity and later was "rediscovered." 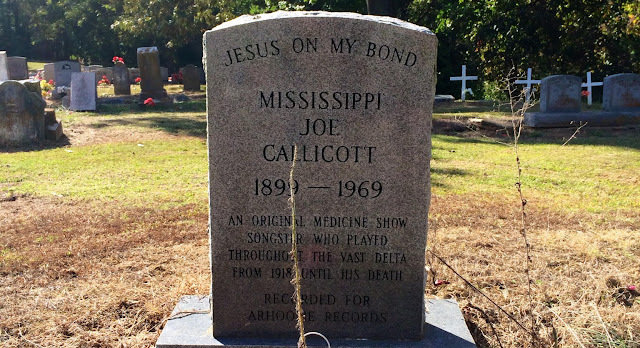 According to noted blues historian Gayle Dean Wardlow of Meridian, who attended the dedication, Joe Callicott made a record in the mid-1930s that vaulted him into stardom. Robert Wilkins, Garfield Akers and Joe Callicott had traveled some 20 miles from the north Mississippi town of Hernando for their sessions. 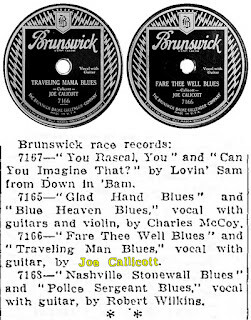 Wilkins recorded two 12-measure blues ("Long Train Blues" and "Falling Down Blues") and a 12-measure song ("Alabama Blues"), yet his remaining title, "That's No Way To Get Along," would become his best known side through his 1960s revision as "Prodigal Son" (which in turn the Rolling Stones would record for the 1968 album Beggars Banquet). Garfield Akers and Joe Callicott made a stunning two-part "Cottonfield Blues," the second side of which has a drone bass akin to that heard in the fife-and-drum music played by African Americans in the regions just south and east of Hernando, Mississippi. Chicago Daily Tribune, Nov 30, 1930. In fact, Callicott recorded only a handful of songs before World War II. 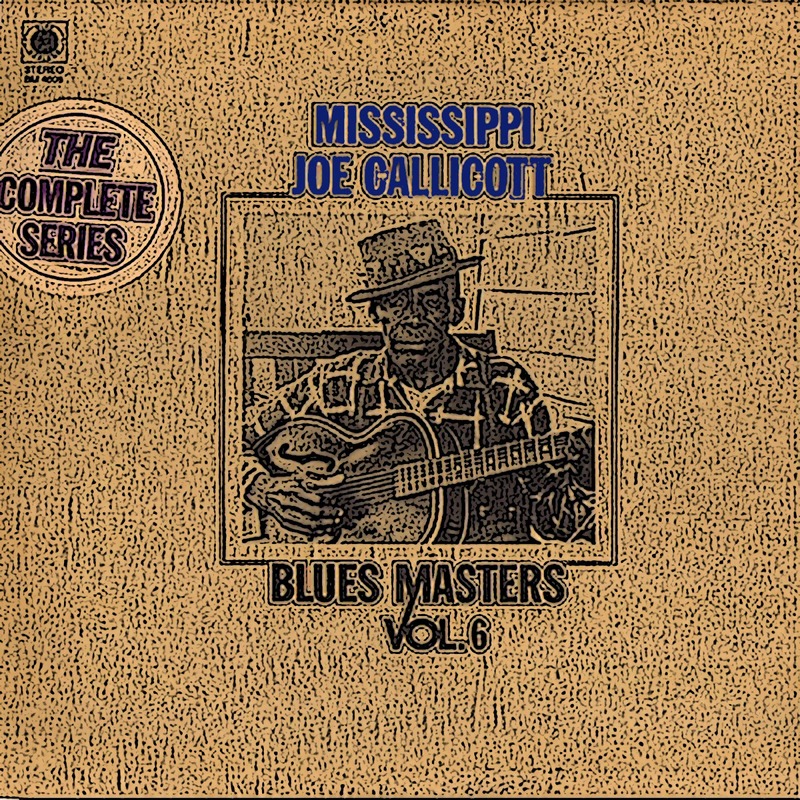 On September 23, 1929 at the Peabody Hotel in Memphis, TN, Garfield Akers recorded "Cottonfield Blues—Part I" and "Cottonfield Blues—Part II" with Joe Callicott on second guitar. 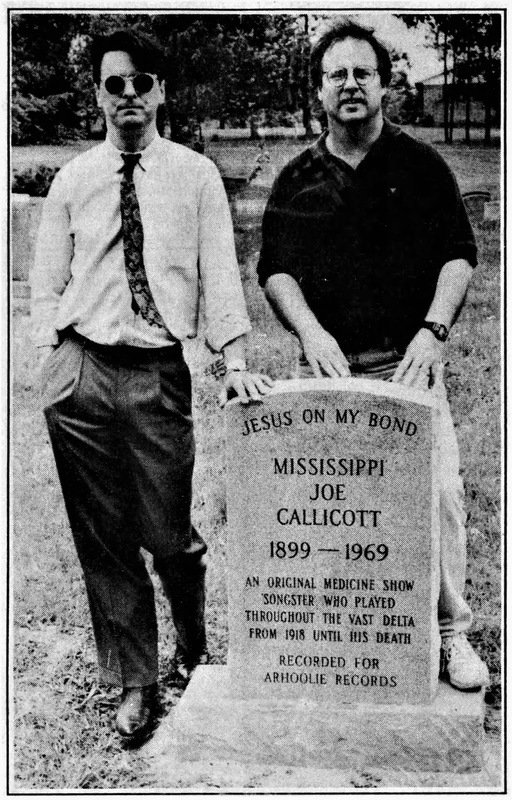 On September 25, 1929 in Memphis, TN; Joe Callicott sang and played guitar on Mississippi Boll Weevil Blues, but it was never issued. 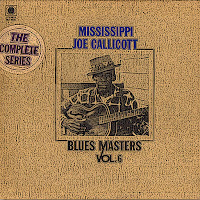 On February 20, 1930 in Memphis, TN, Joe Callicott sang and played guitar on Fare Thee Well Blues and Traveling Mama Blues. 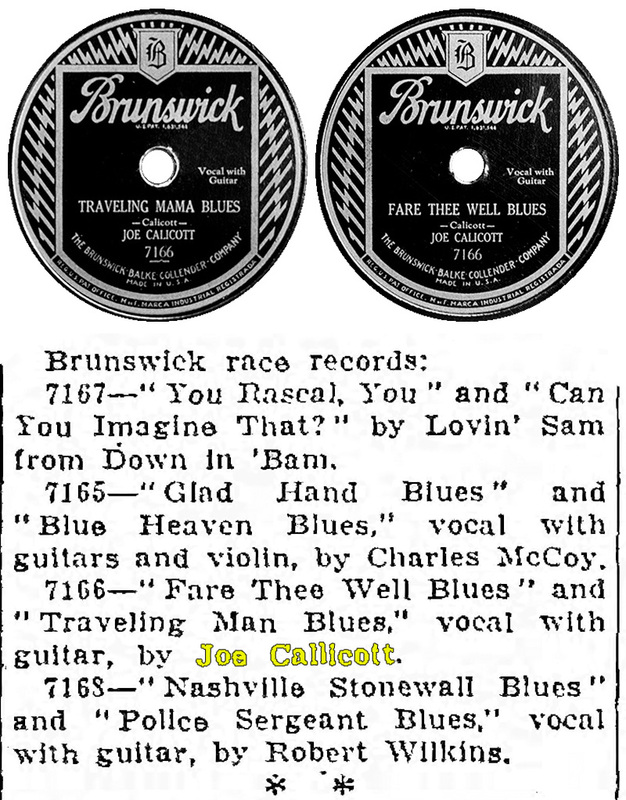 His records were advertised in such publications as the Chicago Daily Tribune, Nov 30, 1930. "Although he probably realized only about $300" from the record company,” says Wardlow, "it meant instant acceptance. He was treated like the president of the United States." According to Wardlow, Callicott was born in DeSoto County, grew up playing music as a teenager, and working in the fields and levee camps. Drawn to Memphis by record companies set up in the Peabody Hotel, he accompanied another musician initially rather than record solo. "He came back later and made a recording. 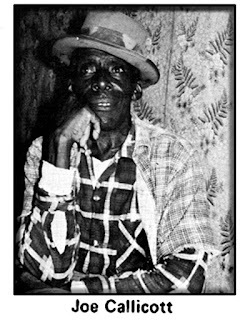 He was a real solid guitar man; played Memphis style guitar," Wardlow explained, in the same vein developed by Memphis songster Frank Stokes, who the Mt. Zion Memorial Fund also memorialized in June 2016 after Memphis author Robert Gordon contacted current MZMF director DeWayne Moore. A headstone now adorns the long unmarked grave of Stokes in the abandoned Hollywood Cemetery in Memphis. Callicott was close to both Bobby Ray Watson and the younger Kenny Brown, explained “Doll” Callicott. She admitted that she was much like a mother to Brown, and their relationship had indeed continued since Joe's death in 1969. In 1995, however, she lived in Memphis with cousins, several of whom quickly brought up potted flowers she had been saving for the occasion. Joe's vintage guitar even came out into the light for the dedication of his new marker. After two dues-paying decades in construction work, Kenny Brown became a fulltime musician around 1990. He and R.L. Burnside had just returned from a successful tour of California and Canada. Acknowledging his long-standing debt to Callicott, Brown contacted Skip Henderson, of the Mt. Zion Memorial Fund, who organized the dedication in Nesbit. It was the sixth memorial of the organization's first twelve from 1990-2000. The marker was unveiled on April 29 in Nesbit for Callicott. The MZMF managed to secure $1,300 in royalties from Arhoolie Records in El Cerrito, California. Skip Henderson presented the money to the musician's widow, who, upon receiving it, exclaimed, "Joe's been holding out on me!" Henderson admitted, "It's all pretty incredible. 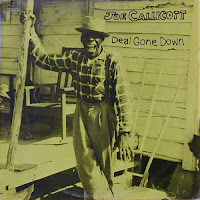 Even though Callicott died in 1969, his wife was still alive at age 93, and she now got $1,300 from her husband's old records. The renewed efforts of the Mt. Zion Memorial Fund since 2010 have been spearheaded by T. DeWayne Moore, a historian and scholar based out of Oxford, Mississippi. The relatives of Tommy Johnson and other interments in Warm Springs CME Church Cemetery obtained a permanent fifteen foot wide and half-a-mile long easement to the important site due in large part to efforts and compelling arguments of Moore, who took over as executive director in January 2014. Under his leadership, the military markers of Henry "Son" Simms and Jackie Brenston were located and restored. 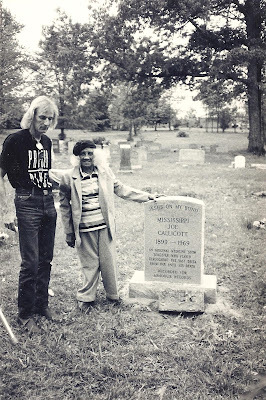 The MZMF has dedicated five new memorials--the headstone of Frank Stokes in the abandoned Hollywood Cemetery, Memphis, TN; the flat companion stone of Ernest "Lil' Son Joe" Lawlars in Walls, MS; and in Greenville, MS, the flat markers of T-Model Ford and Eddie Cusic, and the unique, yet humble, headstone of Mamie "Galore" Davis. In addition, the MZMF monitors legal actions involving cemeteries and provides technical assistance to cemetery corporations and community preservationists in Oklahoma, Tennessee, Mississippi, and South Carolina, such as the Friends of Hollywood/Mt. Carmel Cemeteries, which assists in restoring these two massive and abandoned African American cemeteries in Memphis "back to a beautiful place of rest for all" interments, including Frank Stokes and Furry Lewis.